« Food Friday: French Bread. Yes, I said French Bread. Spring, I know you’re out there. The calendar may say February 11 (happy 20 months to Henry today! ), and the thermometer may read a bone-chilling 14 degrees(!) this morning, a temperature we don’t often see in my balmy coastal locale. But spring, you can’t hide forever. I caught a glimpse of you this morning, and I know it won’t be long before you’re really here, showing off your stuff. And to be fair, it was really blooming last week when it was 48 degrees. Sigh. Click here for more Best Shot Monday! This entry was posted on February 11, 2008 at 8:28 am and is filed under Best Shot Monday, Henry, Photography. You can follow any responses to this entry through the RSS 2.0 feed. You can leave a response, or trackback from your own site. Well, it’s warm here, but no blooms. It’s so dry and apparently we need rain. So I would have to search to get a shot like that. Very nice. we had a flock of robins in our yard last week, so it is coming soon! Spring is here in full bloom! We were in shorts and sun dresses yesterday. I needed that glimpse this morning! It is freezing here and I am sick of sweaters and coats! It was 11 this morning. 11! This gives me hope. Gorgeous photo! I am definitely ready for some spring. This morning’s 18 degree temperature disagreed with me there, though. Happy 20 months to Henry! Lovely photograph compliments lovely post. Spring is certainly here in Britain, daffodils and sunshine– everything is alive– it feels beautiful. May spring touch you soon. Oh wow, I’m ready for spring, how pretty. Terrific photo. I’m wishing for spring, too! Ain’t nothin’ blooming here – minus 6 on my drive in this morning! Beautiful shot…and spring can’t come soon enough. 14 degrees?!?!? GAH, that’s insane! Too cold for me! It feels like spring, almost summer here– it’s been around 70 and sunny for a few days … and I almost wish we were going to get a little more winter. A sight of spring….I so needed that today, because it is grey and FREEZING here! Great shot! Wow – you never know who you’re going to come across in the blogosphere. I sometimes read “Crunchy Domestic Goddess,” and was checking out her blogroll, and happened upon your site! I’ve been blogging for a while, too – I wanted to journal about my pregnancies and about the boys, but knew I wouldn’t do it if I had to write everything out by hand, and now I’m utterly addicted to blogging. it was 1 here, i think. Wow, now that’s some tigh focus! Really cool! I hate to rub it in…but we’re enjoying 70s today. ;o) But then again, by the time you have 70s, we’ll be in triple digits. 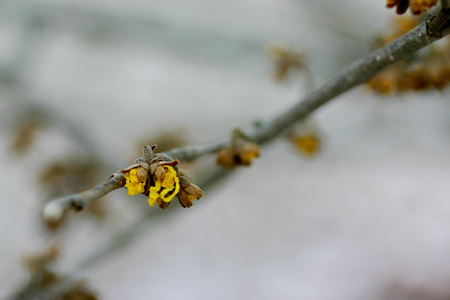 Do you think the witch hazel knows what it is missing by flowering in February and not June with the other trees? Not fair! I want a glimpse of spring. We’ve had some little buds popping out recently, too! But our temperatures have been in the mid to upper 60s the past week or so. Yikes! Oh how pretty! Some actual color in nature! I’m having a hard time finding it around here! How lovely!!! I’ve never actually seen a witch hazel blossom before! Neat! My BSM is up, too! Happy 20 months to Henry and 21 months to Meredith tomorrow, the 12th! 🙂 Pretty soon they will be legal! Gorgeous shot of the bloom, I love the DOF on it. Great eye for what is beautiful. i’ll take ANY sign of spring i can get right now! great DOF and thanks for keeping an eye out for spring!